it means that for every 4 blue counters there are 5 red counters. So if there were 16 blue counters, there would be 20 red counters. This can be worked out by multiplying both sides by the same amount. In the above case, 4 has been multiplied by 4 to get 16. this means that to find the red counters we have to multiply 5 by 4. This will give us 20. 5:6 is the simplest form, as it can't be divided further. The ratio can also be reduced to a 1:n form. This is usually the most helpful as it allows the ratio to be seen clearly. To reduce a fraction to this form, divide both sides by the smallest side. "A necklace is made using blue and red beads in the ratio 7:2, if 30 blue beads are used, how many red beads are used?" 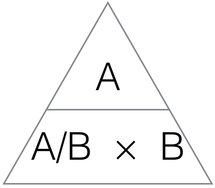 The ratio must always be the right way around, the first number in the ratio always going on the top (A:B). In these types of questions, an amount is split into a certain ratio. "£21,000 is to be split between Emma and Jake in the ratio 4:3. find the two amounts that they each get"
The two sides of the ratio have to be added up first (4+3=7). This will give you the total parts that the £21,000 have to be split into.